This is what it’s all about, and that’s why you are here. Very few books give you that experience because even fewer authors have it. For almost thirty years, I worked the back alleys, poorly-lit laneways, and forgotten neighbourhoods in the city where I grew up. Murder often most unkind, assaults on a level that defied humanity, and sexual violations intended to demean, shame, and haunt the victims were all in a day’s work. Days, evenings, midnights–all the same. Crime knows no time. Whether as a beat cop or a plainclothes detective, I dealt with good people who did bad things and bad people who followed their instincts. I wrote thousands of reports describing their lives, the places they lived, and the things they did. I investigated their crimes and wrote detailed accounts of the activities that brought us together. I also held victims as they wept, talked desperate people off of ledges, and sat beside the decomposing bodies of men and women who, in life, had been discarded and long-forgotten by society. Now, as a retired detective with three decades of research opportunities under my belt, I write crime fiction. I will tell you a story like no other. I will bring you inside a world that is both fascinating and entertaining for you. I will seamlessly weave truth and fiction together for you to create a place where the Good Guys ultimately win. And because you deserve to have the most authentic crime fiction experience every time you pick up one of my books. Right now, I’m working on the Mike O’Shea series. I think you’ll love it. 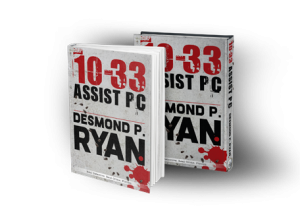 Click below to read the first chapter of 10-33 Assist PC. After that, be sure to order the book to get the full story. Then sign up for my bi-weekly newsletter, where you’ll be given updates on my latest book, cut and unreleased chapters (ones that my editors thought were a little too graphic for your tender eyes…as if! ), opportunities to beta read upcoming books, and the inside scoop on what my commitment to bringing you great crime fiction looks like. And, of course, I would love to chat with you about all things Detective, Crime, and Fiction. Don’t be shy. Drop me a line and I’ll get back to you.